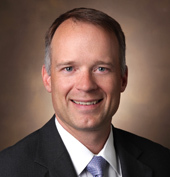 Mitchell Edgeworth, MBA, chief operating officer for Vanderbilt University Hospital and Clinics, has been promoted to CEO of Vanderbilt University Adult Hospital and Clinics. Edgeworth succeeds David Posch, who has served as CEO of the adult hospital and clinics since 2011. In this new role, Edgeworth will report to C. Wright Pinson, MBA, M.D., deputy vice chancellor for Health Affairs and CEO of the Vanderbilt Health System. His appointment is effective July 1. Edgeworth joined VUMC in 2012 as chief operating officer for Vanderbilt University Hospital. In 2014, he was promoted to chief operating officer for Vanderbilt University Hospital and Clinics. “We are fortunate to have such an outstanding leader already supporting our health system to assume this important role. Mitch is passionate about our missions and deeply committed to VUMC’s future. His experience as a hospital and health system leader make him ideally suited to assume the helm of our adult hospital and clinics as we continue to lead through this period of rapid change in health care delivery,” said Pinson. As CEO of Vanderbilt University Adult Hospital and Clinics, Edgeworth will focus on all aspects of operational performance for the adult clinical enterprise, ensuring patient-focused, high performing, results-oriented operations that support VUMC’s mission, vision and business operations. He will work closely with the clinical department chairs and operational leaders throughout the Vanderbilt Health System. Prior to joining VUMC, Edgeworth was with Quorum Health Resources where he served as regional vice president and was responsible for the operational performance for 12 hospitals located across multiple states. Prior to Quorum, he worked for Tenet Health System serving in leadership roles, including CEO of Doctors Hospital in Dallas. “It has been an honor to serve Vanderbilt over the past three years, and I am humbled and excited to move into this new role. Our faculty and staff dedicate themselves every day to improve the health of our community, train future health care leaders and create innovation that changes lives for the better. I believe very strongly in our mission and am privileged to work with so many other talented leaders who believe in it as well,” said Edgeworth. Edgeworth holds a Bachelor of Science degree from Lipscomb University and a Bachelor of Industrial Engineering degree from Georgia Tech. He received his Master of Business Administration from Duke University while working at Duke University Health System as a management engineer manager of performance services.